...above Colorado Springs Airport. However, one balloon had a particular mission and stood out from the rest. The launch was brief to the casual observer, but was part of a demonstration of the Combat SkySat military retransmission platform for members of the U.S. Army Space and Missile Defense Command/Army Forces Strategic Command. The event included a briefing by members of the command's Future Warfare Center and Battle Lab to senior Space and Missile Defense Command, or SMDC, leadership on the Combat SkySat system, its capabilities, and how it can be applied to the Army mission. Those in attendance included Lt. Gen. Richard Formica, commanding general; Ronald Chronister, deputy to the commander; Brig. Gen. Timothy Coffin, deputy commanding general for operations; Laurence Burger, director of FWC; and other SMDC personnel in the Colorado Springs area. Capt. Joseph Mroszczyk, Training and Doctrine Command capability manager for space and global missile defense, prepares to release the SkySat balloon and payload from 2525 Aviation Way, Colorado Springs, Colo., during s demonstration of the system. After questions and a close examination of a sister system—the Combat SkySat Tethered system—on display inside a warehouse, the group moved outside and at 7:31 a.m., Capt. 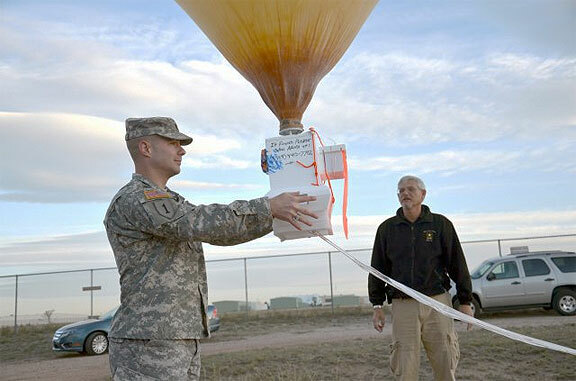 Joseph Mroszczyk, space and missile defense officer, from the Training and Doctrine Command capabilities manager for space and global missile defense, assisted in the release of the balloon carrying a communications payload and power supply. 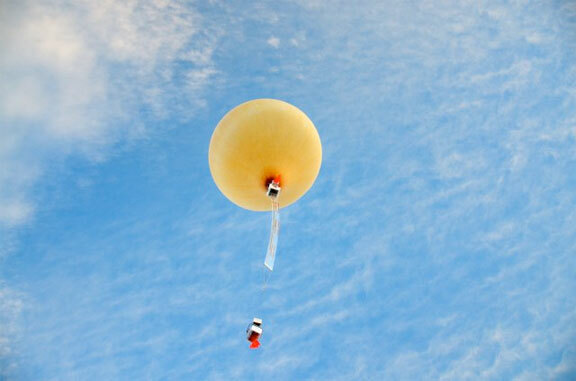 According to Battle Lab officials, the balloon and its payload reached an altitude of 30,000 feet and was brought down after 30 minutes aloft (the system is designed to stay up for 12 hours.) The balloon and its package came down safely 62 miles east of Colorado Springs. The Combat SkySat military retransmission system lifts off into the Colorado sky eventually reaching an altitude of 30,000 feet during a demonstration on the morning of Oct. 11, 2012, in Colorado Springs, Colorado.